When we were on a service trip in Camden, we had a free night to do whatever we wanted. Our youth group decided that instead of leaving the city and having a night out in Philadelphia, we would stay in Camden and try a local Mexican restaurant. The restaurant was a good experience and a nice way to meet some people who both live and work in Camden. The place is called Lupita’s. The service was extremely friendly (it was like we were being welcomed into the owners’ home), and there were free chips with two types of dip, refried beans, and cheese as an appetizer. Leah and I and the two other girls on the trip split a plate of nachos as well as a pizza with a bunch of things, including some sort of chipotle sauce, ham, and avocados. While the pizza wasn’t that great (I mean, it was a Mexican restaurant, not Italian! 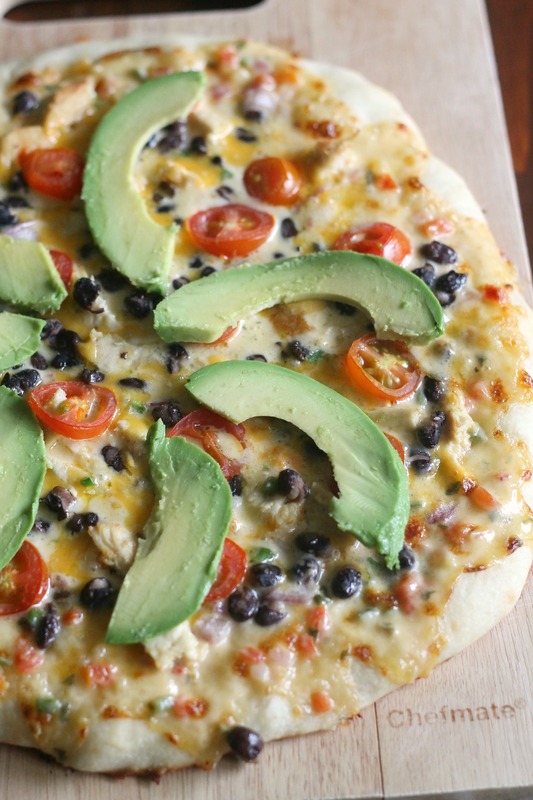 ), the avocado on top was a good addition and it inspired us to try our own Mexican pizza! Our initial plan was to make a homemade tomato sauce with the flavors of salsa by adding jalapeno and lime, but then I had a brilliant idea- use queso sauce on the pizza! (I wish I would have a lightbulb moment like that when writing college essays, but it hasn’t happened yet.) We googled “pizza with queso sauce” to see if it had been done before, and the answer was no, so we were a little nervous to go out on a limb and try something new. Luckily, it worked fabulously, and how could it not have? Queso is amazing! We made a quick marinade with lime, cumin, and cilantro for the chicken, mixed black beans with red onion and jalapeno, and made queso sauce. We put all of that on the pizza crust with sliced tomatoes and a light sprinkling of cheddar cheese, crossed our fingers, and baked it. We topped the finished pizza with sliced avocado, cut it into wedges, and promptly decided it was one of the finest pizzas we’ve made. This pizza just works (even though it sounds a little weird), and while it’s far from traditional, we loved it! In a bowl, combine the ingredients for the marinade. Place chicken breasts in a large ziploc bag, pour in the marinade, seal, and shake the coat the chicken. Refrigerate for 15-30 minutes. Heat a pan over medium heat and add the chicken (you can also use your grill). Cook until the chicken is cooked through and no longer pink. Let the chicken rest for 5 minutes, then cut into small pieces. Refrigerate until ready to use. Combine the beans, red onion, and jalapeno in a bowl. Set aside until ready to use. Heat the oil in a medium saucepan. Add the jalapeno and onion. Cook for five minutes or so until softened. Stir in the cheese and milk until smooth, adding more milk as needed to make it thick but pourable/spreadable. Stir in the tomatoes and cilantro. You shouldn’t use pre-shredded cheese for this sauce. Keep the queso cooking on your stove’s lowest setting so it stays fluid while you are assembling your pizza. Preheat your oven to 500 degrees with the pizza stone on the center rack. Press one ball of pizza dough out on a piece of parchment paper into a circle. Top with nice layer of queso (somewhere between a half and 2/3 cup) and then add the chicken, black beans, tomatoes, and cheddar. Bake the pizza for 8-10 minutes, until the crust is starting to brown and the cheese is bubbly. 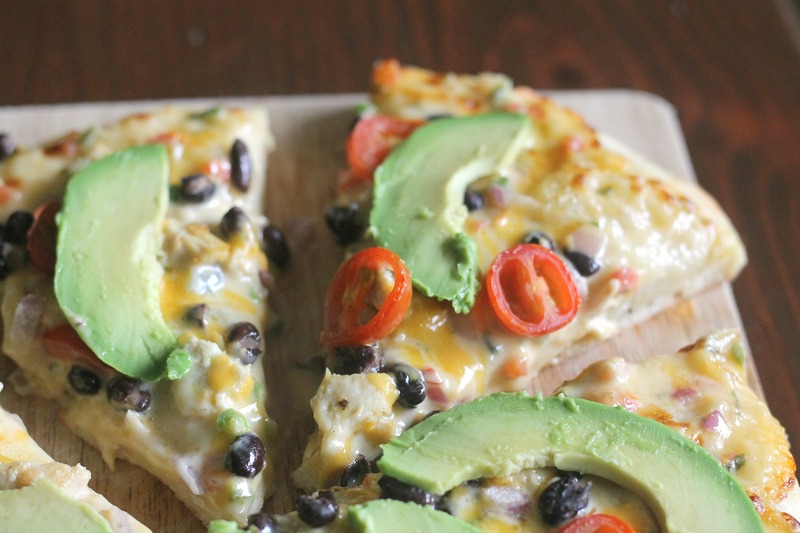 Arrange half of the avocado slices on pizza in a circle. Cut into slices and serve. Repeat. Enjoy! Note: If your queso seizes up at all, just re-melt it over low heat. You’ll have some extra queso sauce- either dip the crust or corn chips in it!